Bioavailability starts when a nutrient passes from the digestive system into the bloodstream. Absorption into the bloodstream, however, is only a partial measure of the body's ability to benefit from a nutrient. 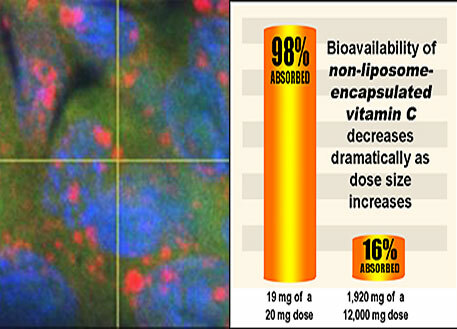 In one study with non-liposome-encapsulated vitamin C, 19 mg of a 20 mg oral dose entered the bloodstream. As the dose size increased beyond 30 mg, the blood level of vitamin C decreased drastically. They reported that a dose of 12,000 mg produced a maximum absorption of 16% into the bloodstream — That's less than 2,000 mg! This chart represents one of the more optimistic views of vitamin C bioavailability. A National Institutes of Health study suggests that only 200 mg of a single dose, regardless of size, actually gets into the bloodstream. Bioavailability, is only half of the picture, however. The nutrient must also be able to pass into individual cells. Cellular uptake is required to obtain maximum benefit from nutrients. Recent fluorescent microscopy from laboratory tests with LivOn's "Smart" liposomal Nano-spheres®, confirms passage of these liposomes across cellular membranes and into cultured liver cells. The bright magenta spots show that uptake of fluorescent-dye-tagged liposomes.